The Polonsky Academy is based at the Van Leer Jerusalem Institute, Israel’s leading independent research institute, and neighbors Israel’s Council of Higher Education and the Israel Academy of Sciences and Humanities. Polonsky Fellows form a vibrant research community in the humanities and social sciences, with the freedom to conduct their own research independently or in collaboration with ongoing projects at the Van Leer Jerusalem Institute. Fellows, if they so wish, also have the opportunity to teach at leading Israeli universities. Fellows are awarded $40,000 per year for a period of up to five years, enabling them to develop their individual research and to advance their academic status. Spending at least three days a week at the Polonsky Academy during the academic year, Fellows are also encouraged to attend and organize international conferences and workshops, for which an additional grant may be provided. They meet weekly for a joint seminar, where work in progress is presented and discussed, followed by a joint meal. Funding is also available for Fellows to have the possibility of inviting established international academics. What facilities does the Polonsky Academy offer? The Polonsky Academy offers each Fellow a spacious personal office with a computer; printing/scanning facilities; a kitchenette for coffee and refreshments; and a very effective support system for organizing conferences, reading groups and meetings. The Academy building also contains seminar rooms for meetings, conferences, workshops, etc., an auditorium for public talks, and a lunch cafeteria, and is surrounded by a beautiful garden. The Polonsky Fellowship is highly competitive, with about 400 applicants per year, and with an average acceptance rate of 1.4%. The call for applications is advertised each year in November. The deadline for submitting applications is January 7. The start date is October 1. Applicants are expected to submit an original research project in the humanities or social sciences. They may do so even before completing their PhD, so long as by the beginning of the Fellowship, they have completed all requirements for their degree. Fellowships last up to five years, subject to yearly renewal which is conditional upon the submission of a progress report that demonstrates their continuous progress in research. Applicants need not have any special connection to Israel, and no knowledge of the Hebrew language is required. 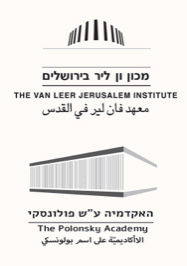 To apply, please visit http://www.vanleer.org.il/en/polform. Applications should include the following documents in English, in separate files: statement of research plans (3-5 pages, with title); summary of your previous research (3 pages); one single-authored published article or equivalent unpublished work; curriculum vitae, including list of publications; complete contact information, including phone numbers, for three possible referees. What do Polonsky Fellows do after their fellowship? Polonsky Fellows typically move on to tenure-track positions at international universities or research institutions after, or in some cases during, their Fellowship. So far, well over half of Polonsky Fellows were offered academic positions within or immediately following the term of their Fellowship.